This luxurious 5-star hotel is situated in Dibba, Downtown Dubai and is a stone’s throw from the beach. 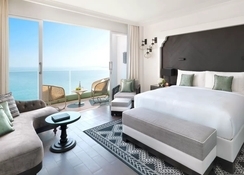 Nestled among the idyllic Al Hajar Mountains, the picturesque Fairmont Fujairah Beach Resort is the perfect stay for guests seeking sophistication and serenity. There are 180 beautifully decorated guest rooms and suites, each complete with an inspiring blend of bohemian and art-deco furnishings and ocean or marina views. Guests can take advantage of hotel facilities including a swimming pool, sun terrace, Willow Stream Spa with relaxation services, watersports at the nearby diving centre, an Aqua Bounce floating waterpark and daily entertainment at the kids’ club. 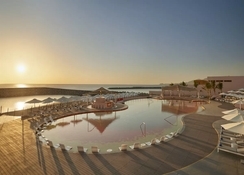 In addition, guests have the pleasure of visiting the Lava Beach Club for an elite afternoon with jacuzzis, sunken pool bars, live DJs, a swimming pool, kids’ club and more. 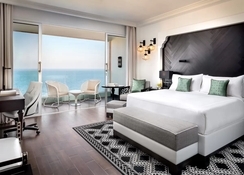 Indulge in gourmet cuisine at Fairmont Fujairah Beach Resort’s five distinct dining venues, or venture outside of the hotel and discover what Dubai has to offer. 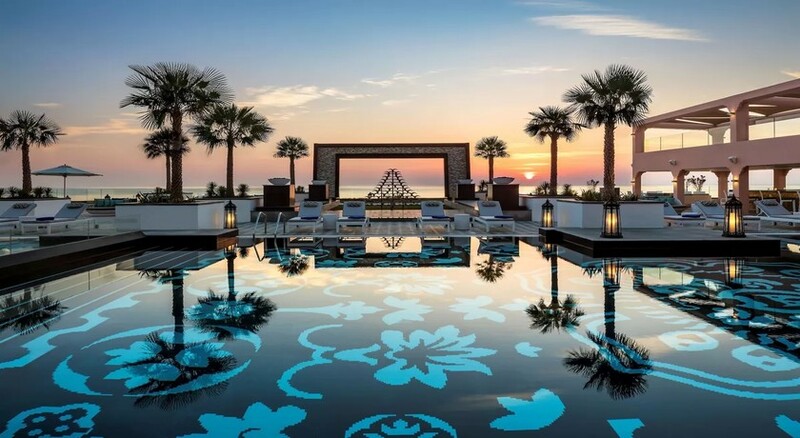 Fairmont Fujairah Beach Resort is nestled within the majestic mountains, in Dibba, Downtown Dubai. Hiking trails and ancient historical sites are at a short proximity to the hotel, while a gorgeous stretch of public beach can be reached after a short 5-minute walk. Al Aqah is 10km from Fairmont Fujairah Beach Resort, whereas Khor Fakkan is 26km from the property. The closest airport is Ras Al Khaimah International airport, 42km from Fairmont Fujairah Beach Resort. The spacious guestrooms are fitted with a flat-screen TV. Some units have a balcony where you'll be able to relax and enjoy a cup of coffee. The rooms include a personal bathroom with a shower and basin, with bathrobes provided. For your comfort, slippers, free toiletries and a hairdryer are provided. Dining choices at Fairmont Fujairah Beach Resort are aplenty. Canvas, the resort’s all-day-dining restaurant provides a wide variety of international and regional dishes. 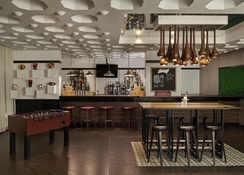 Arena Sports Bar & Kitchen is a laid-back, European-style eatery where guests can unwind with a bite to eat and live sporting action. The Copper Lobster is a night ocean grill restaurant serving up the freshest catch-of-the-day in a gastro bar setting. IAMMAI is the resort's serene poolside lounge and bar which serves a variety of light bites and cocktails. Lava Beach Club's "MediterrAsian" restaurant is also a spectacular choice, for those after something a little special. 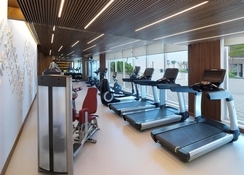 The property has a plethora of sports, games and entertainment facilities to take advantage of during your stay. Whether you make a splash in the swimming pool, lounge on the sun terrace, pamper at the spa or head to the nearby beach – you’ll have plenty to keep you occupied both in and out of the resort. Nearby you have the Aqua Bounce floating waterpark, or you can get involved in the watersports or go snorkelling instead. Hiking trails and archeological sites are within close proximity to the building, for those that like to admire the local culture.